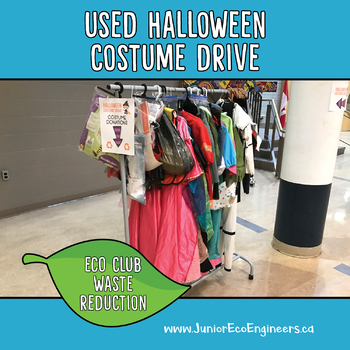 Reducing the school community’s waste is a great initiative for any school or Eco Club. 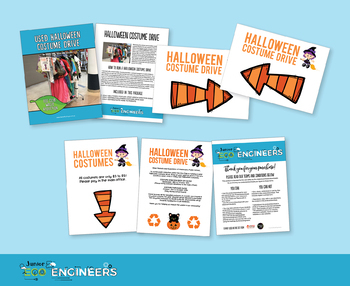 One of the biggest types of textile waste in North America is Halloween Costumes. Halloween Costumes are just as good as brand new ones. This package is meant to be used for the whole school as part of an Eco Club/Eco Team project to spread awareness through out the school about recycling and properly sorting waste. To purchase this for the whole school please just purchase ONE. You may print enough labels to use in every classroom and as many posters as your school needs. Each school must purchase their own license. Also makes a great play centre for Kindergartens and learning to sort waste.